When Frank and I lived in the Nashville area, before we moved to California, we would occasionally eat sushi at this restaurant called Wild Wasabi. Frank and I rarely eat out because (1) it’s expensive and (2) it’s nearly inevitable you’ll be eating GMOs from GMO oils or meat that was fed GMO corn and soy, not to mention pesticides on non-organic food and any aluminum cookware. I don’t want to sound like a stick-in-the-mud, but for me, it’s a real problem. Frank calls me the “canary” for a reason. I react to EVERYTHING. Rancid oils and aluminum cookware make me break out in a rash and feel miserable for days. ANYWAY, so because all things not natural make me sick (and make YOU sick, but maybe you just don’t have severe reactions! ), we eat at home 99% of the time, and eat out maybe once a month or once every two months. Since we moved away from Tennessee, we’ve tried a few sushi restaurants here in the Bay Area, but we haven’t found a winner yet. So we set out to replicate one of our favorite specialty rolls the “This-Is-How-We-Roll” roll from Wild Wasabi. 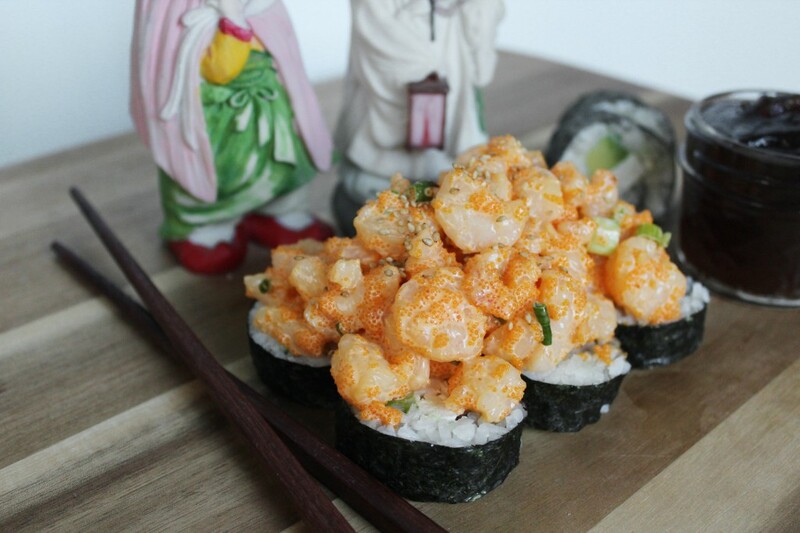 Or rather, the “Spicy Shrimp Roll!” And we succeeded!! To make your sushi roll, you’re going to need a bamboo sushi mat (buy here) and some seaweed nori sheets (buy here). Lay a piece of seaweed shiny side down on the bamboo mat. Then, spread 1-1/2 cups of rice onto the seaweed in an even layer, leaving 1 inch on a single edge. Lay strips of whatever you want in the center of your roll across the middle. We used avocado and sheep’s cheese. :) Pastured goat’s cheese would be good, too! Starting from the edge across from the 1 inch space you left, roll tightly, holding the ingredients tight to the inside, and then cut to size, and arrange the pieces flat on a plate. In a large skillet, heat 2 TBSP oil on medium-high. (We used coconut oil, but avocado oil would also be great.) Cook 1 lb. wild caught shrimp in a single layer until they are pink on one side. Then flip over and cook the other side until the shrimps are totally pink. Drain using a colander. Then transfer to a cutting board and chop into 1/2 inch pieces. Toss the shrimp in the sauce, and spoon onto the pieces of sushi roll. Garnish with eel sauce and sesame seeds (and more sriracha, if you like spicy like me!). We love Yoshi’s in Brewer Maine. The sushi is bigger AND cheaper. We get plenty full. They make their own salad dressing that can’t be compared to anything you’ve used before. Amazing. Only one I’ll go to and I’ll eat it pregnant – I trust them a lot. If you ever come to Maine I would just love to meet you all. Nothing like sharing a meal with the rare like minded people. Sounds yummy! I’ve never been to Maine. No, no..its not you…its me. :O Really. Ok, I will try.